If you're specifically looking for a Silent Gliss Electric Curtain Track, you may already be aware of the build quality and range of products that they offer. What you may not know of, is any of the amazing projects that Silent Gliss products are used in around the world. 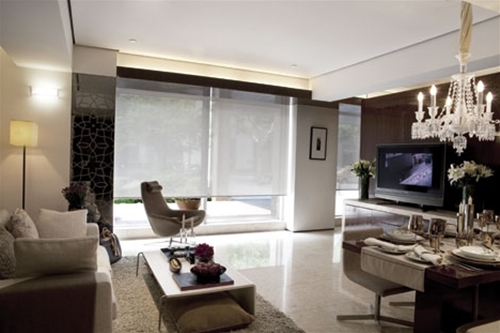 Silent Gliss rollerblinds were selected for brand new, exclusive apartments in Shanghai, China. The project saw the fitting of over 2,600 roller blind systems into offices, bathrooms and apartments inside two luxury residential towers. The apartments are targeted at the very top end, with the monthly rental of a 2 bedroom apartment costing up to £3,800 GBP. From the chandelier in the entrance hall, to the Rolls Royce chauffer service on offer to residents, you can see that the selection of silent Gliss for their window furnishings says a lot about the brand. Built as a beacon of accomplishment for modern, sustainable technologies, the Monte Rosa SAC Lodge near the town of Zermatt in Switzerland has been fitted out with Silent Gliss rollerblinds. The lodge is nearly 3 kilometres above sea level, and the thermal properties of the blinds help keep the heat in during the depths of the freezing Swiss winters, and keep the blazing sunlight out during the day. Silent Gliss themselves provided the blinds to the project as a demonstration of how the correct window furnishings can contribute to an energy-saving building of the future. The lodge is nearly self-sustaining, producing 90% of the energy required to run all by itself. These are just two examples of where Silent Gliss products are used for their robustness, elegance and technology. See our range of electric curtain tracks and see how your own home can benefit from the same incredible level of luxury.